Please click here to buy your Casio ClassPad on Amazon. In 2003, the original Casio ClassPad 300 was a revolutionary device. Released near the height of the PDA craze, it’s stylus interface and high resolution screen (for the time) brought many of the popular features of “Palm Pilot” type devices to students and teachers in the classroom. Since 2007, the ClassPad 330 has been the latest version of the ClassPad series. Through the years, there have been some memory upgrades and operating system upgrades, but the ClassPad 330 is not a huge departure from the original 300. I was so curious to review the Casio ClassPad. It’s one of those calculators that is always on the list of banned devices for standardized tests and math competitions due to its stylus input. There’s really nothing else like it out there. I was really impressed with the Casio 9750GII and 9860GII and wanted to see how the ClassPad would compare. Who is the ClassPad 330 designed for? You almost have to think of the ClassPad as being in a different category from the average graphing calculator. It’s less of an “answer finder” and more of a “learning device.” To some extent, the TI-Voyage would also fall into this category. The emphasis with these types of devices is less on simply finding the answer to a question and more on helping students understand mathematics in a deeper way. Even though some of them are banned from standardized tests, but that’s not really the whole story since they are more exploration devices than number crunchers. In the time I spent working with the ClassPad, here are a few of the points that stuck out to me most. The ClassPad is a full-featured device. With the basic operating system install, you get a computer algebra system, statistics analysis, spreadsheet, dynamic geometry, conics analysis, differential equations graphing, sequence calculations, and a thorough financial calculator. Granted, a lot of these features are available with the cheaper Casio fx-9860GII. But the ClassPad offers additional features to most of them, they run at a higher resolution, and the larger screen allows many of the features to run in split screen, meaning you can edit equations or data on half the screen and immediately see the result in the other half. The ClassPad’s touchscreen is simple to use and responsive. Although stylus inputting is probably on it’s way out (SEE: Palm, Inc.), there’s something about using a stylus in a classroom setting that seems more appropriate than using it with your cell phone. In any case, there’s no need to learn an writing interface like Palm’s “Graffiti,” since every function of the ClassPad is either accessed by physical buttons or by pop up virtual keyboards on the touchscreen. It’s not as “dynamic” as you might hope for when adjusting circles, points, lines, etc., since you don’t see the picture change until after you lift the stylus. However, it’s much easier to make adjustments with a stylus than arrow keys. Texas Instruments has done a nice job with dynamic geometry on their TI-Nspire, but it’s still not as simple as being able to use the ClassPad’s touchscreen. It’s not the most confusing calculator calculator on the market, but you also can’t just jump in and know what you’re doing in minutes like with Casio’s fx-9860 series. When I started working with the Casio 9860GII and 9750GII, I hardly had to look at the manual. That was not the case with ClassPad. Expect to invest some time really learning you’re way around the calculator and you’ll eventually impress your friends with all the cool tricks you can do. The Casio classpad series is banned from just about every standardized test including the SAT, the ACT, and the AP Calculus test. As stated before, that sort of usage isn’t really the point of the ClassPad, but if it’s important to you, you’ll need to develop a backup plan for test day or look elsewhere. This is a strong device with some very impressive capabilities. The touchscreen plus computer algebra system are a powerful combination. That said, don’t expect the graphing calculator version of an iPod touch. If you’re used to that type of device, you’ll probably expect the stylus to do some things that it doesn’t. This is especially true in graphing mode, where you must still use the keypad to do things like adjust the viewing window, trace, find intercepts, etc. Nonetheless, the ClassPad is a unique calculator with special capabilities. 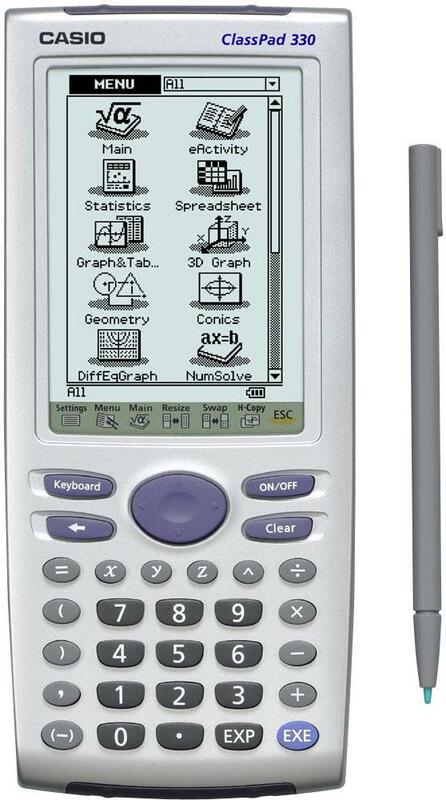 The only other major release of a stylus based graphing calculator to date was Sharp’s EL-9600 series, which didn’t stick around nearly as long as the ClassPad has. While experimenting with ClassPad for this review, I found myself trying compare it to the TI-89, TI-Voyage, TI-Nspire CAS, even Casio’s own fx-9860GII, in part due to the Classpad’s similar cost at Amazon. It’s really not an “apples to apples” comparison with any of them. The Casio ClassPad 330 really is a one of a kind device.